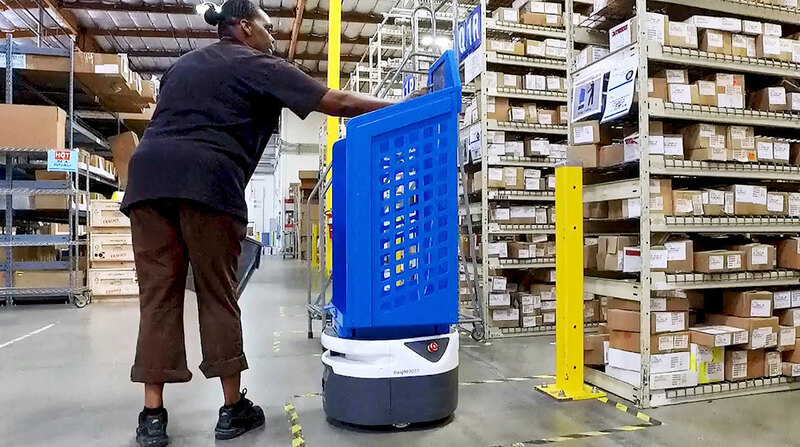 The Silicon Valley-based third-party logistics company said it has completed testing and deployed Fetch Robotics’ CartConnect autonomous mobile robots in an expansion of robot-assisted support for warehousing and distribution operations, according to a company news release. The robots will assist fulfillment and shipping operations for high-tech manufacturing clients, said Rock Magnan, president of RK Logistics. The Fremont, Calif.-based company said it operates 14 warehousing centers in the greater Bay Area representing nearly 1 million square feet of commercial space used for inventory management, manufacturing support and e-commerce fulfillment. But RK Logistics’ robots don’t want the jobs of the 600 humans who work there, the company said. Instead, they want to help with the mundane work. Magnan said the real benefit of the robots is that they relieve employees from tedious, low-value work such as walking a cart full of items from order assembly areas to shipping, and then walking the cart back. Such robotic help “frees up time for them to focus on more higher-value activity,” Magnan said in the release. The news comes as more and more logistics and shipping companies incorporate robots in warehouse operations. The robots are especially helpful in final-mile operations in warehouses that are closer to the customers, said Natan Reddy, a senior intelligence analyst for CB Insights of New York City. Reddy said warehouse robots help businesses build their warehouses upward, whereas large warehouses farther from customers tend to be spread out. Urban warehouses will likely need to make use of valuable space. The vertical stacking of products, however, is something better handled by robots, Reddy told Transport Topics. Reddy said more retailers are trying to solve the problem of final-mile as e-commerce grows. And micro-fulfillment robots are especially popular with grocery companies. Just one grocery order can take an hour to assemble, according to Takeoff, a Massachusetts retail software company. Robots help the “picking” and bagging go faster. RK Logistics said worker orders fulfilled per hour increase significantly when employees don’t have to walk back and forth to the shipping dock. The company has used Fetch’s HMIShelf robots for the past three years. The units have a fixed-capacity cart attached and can take up to a dozen small parcels, boxes or totes, according to RK Logistics officials. The robots are operated by an onboard touch screen, so when employees are finished loading the robots, they are sent on their routes, according to RK Logistics. At the destination, another employee unloads the cart and then sends the robot back to its origin. RK Logistics also uses robots with higher-capacity carts. The new CartConnect robots do not have fixed carts attached. RK Logistics said they are designed to carry larger boxes and totes, and then autonomously deliver the carts to a destination. The units can be operated remotely by any internet-enabled device, such as a hand scanner or through direct integration with warehouse systems. The use of robots also eases personnel pressures, Magnan said. The company has many positions open, and has found the robots are a positive recruiting tool to attract workers, because the company can note mundane tasks and walking back-and-forth has been eliminated.